Members wishing to purchase 2018 Christmas cards should complete the order form in the Members Area of this website. The form can be found under the "Market Place" Section which also has several other items for sale, including ties, badges and several interesting books. 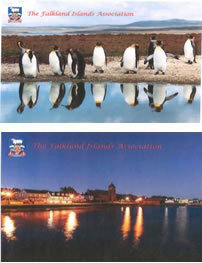 Those wishing to join the Falkland Islands Association can do so in the "Join Us" section of this website.